RUNNER UP Best Short Film Audience Award! The closing of the The Cafe Edison (aka The Polish Tea Room), the Broadway diner immortalized in Neil Simon's 45 Seconds from Broadway, is not just a story about another famous show business haunt shutting its doors, it is the fading away of a piece of an America past. The Cafe Edison is an American Dream come true story about a multi-generational, big-hearted, mom-and-pop family business that is tragically and prematurely coming to an end. It's also about gentrification on steroids and all-consuming greed. It's about the heart, soul, authenticity, and distinctiveness of cities globally being flagrantly ripped away for yet another impersonal, cookie-cutter, corporate chain. 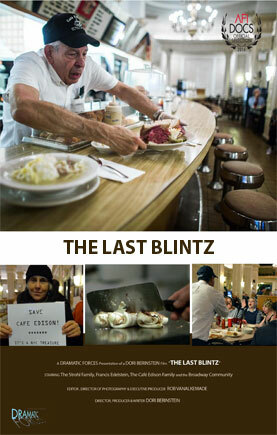 It's too late for The Cafe Edison... but, looking to the future, THE LAST BLINTZ is an impassioned plea for 'progress' that honors the past, protects the future and preserves the heart and culture of our great cities...before there's nothing left. Dori Berinstein is a four-time Tony-winning Broadway producer and an Emmy-award- winning director, producer and writer of film and television. As an award-winning Documentary Filmmaker, Dori directed, wrote and produced: Marvin Hamlisch: What He Did For Love (2013 / Emmy Award / American Masters; Best Documentary – Atlanta Jewish Film Festival); Carol Channing: Larger Than Life (2012 – Showtime; Audience Award – St. Louis Int’l Film Festival ); Gotta Dance (2009 – Audience Award – Palm Beach Int’l Film Festival); Some Assembly Required (2008 – Best Documentary, Int’l Family Film Festival); ShowBusiness: The Road To Broadway (2007 – Showtime - IDA Finalist 2006; Grand Jury Award Best Documentary Florida Film Festival). Dori’s 12 Broadway productions include: Who’s Afraid of Virginia Woolf (Tony Award); Legally Blonde: The Musical (Olivier Award), Thoroughly Modern Millie (Tony Award), The Crucible, One Flew Over The Cuckoo’s Nest (Tony Award), Fool Moon (Tony Award), Flower Drum Song, Enchanted April and Golden Child . Dori’s next Broadway Musical, Half Time, inspired by Dori’s documentary film Gotta Dance, will open on Broadway spring 2017.